Allen and Georgie Manuel are a husband-wife team who make traditional costumes of the Cajun courir du Mardi Gras, the celebration of Carnival season in rural South Louisiana. 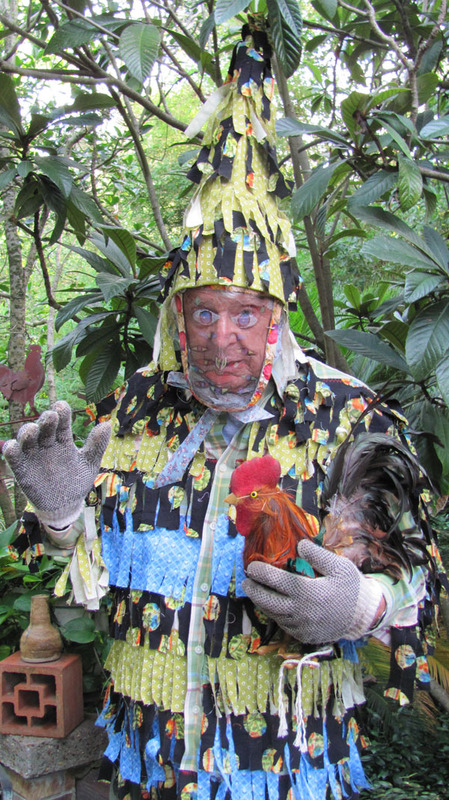 St. Landry parish native Georgie Manuel fabricates the traditional costumes of the Cajun country "courir du Mardi Gras" with wire screen masks, patchwork suits and pointed hats known as "capuchons." Allen and Georgie Manuel are a husband-and-wife team who make traditional costumes of the Cajun courir du Mardi Gras, the celebration of Carnival season in rural South Louisiana. Both natives of Eunice in St. Landry Parish, the Manuels fabricate the ensembles’ wire screen masks, colorful patchwork suits, and pointed hats known as capuchons. The Manuel’s decades-long commitment to making the whimsical and symbolic attire of Mardi Gras has helped to preserve a defining tradition of Louisiana’s Cajun communities, one that traces its origins to medieval France. Mardi Gras in Eunice was celebrated as early as the 1890s; however, not until the 1950s, following a period of disinterest during the two World Wars, did it take hold. Today, it is one of the largest celebrations with approximately 1,500 participants. Like other Carnival celebrations in Louisiana’s rural prairie parishes, the event is defined by the courir de Mardi Gras, or Mardi Gras “run.” Led by a designated capitaine, the Cajun courir brings together costumed revelers who, on horseback and hay wagons, drink and dance their way across the countryside while begging for food or money to make a gumbo at day’s end. In much of the region, custom dictates that participants, known as les Mardi Gras, conceal their faces to become anonymous to friends and strangers alike. Mass-produced European screen masks appeared in late nineteenth century wholesale catalogs that circulated in the region; however, in the early twentieth century, Cajun revelers, unable or unwilling to purchase the prefabricated disguises, began crafting their own. The Manuels—using the techniques that Georgie learned from her seamstress grandmother, Alma McGee, and Allen gained from his capitaine father, Témon Manuel—joined in the tradition in the early 1970s. Allen begins the multistep process by cutting galvanized wire screen into eight- to ten-inch square pieces. Using a handmade wooden mold and a ball-peen hammer (a metalworking tool characterized by its spherical head), he shapes the screen to mimic a three-dimensional facial form. Georgie then frames each mask with patterned fabric, enhancing its decorative aesthetic while also offering the wearer protection from the screen’s rough edges. The final step occurs with the rendering of caricatured facial features using enamel paint. Notably, in other Cajun communities three-dimensional eyes, noses, and mouths are created with plastic or fabric applications. Historically, most individuals in prairie Cajun communities lacked the means to purchase yards of costly new material and ornamental trim. Thus, costumes were made of old work clothes accented with fringed strips of feed sacks and other remnants. Contemporary costume-makers such as the Manuels have retained this patchwork aesthetic, but vibrant, and sometimes store-bought, fabrics have largely replaced the drab salvaged materials. 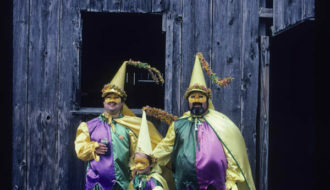 Small metal bells sewn onto revelers’ tops and pants complement their costumes’ visual cacophony while gloves help to conceal individual identities. The final and, perhaps, most distinctive component of the Cajun Mardi Gras costume is the capuchon, a tall conical hat once meant to parody the headwear of European noblewomen. In the early 1900s, Mardi Gras runs commonly featured two additional styles of hats intended to mock the social elite: the peaked bishop’s miter and the scholar’s academic mortarboard. While capuchons dominate contemporary runs, in some Cajun communities participants occasionally wear the square academic headdress. The Manuels’ capuchons are formed of heavyweight interfacing covered in the same fabrics and trim utilized for their costumes. The Manuels regularly demonstrate their tradition at the New Orleans Jazz & Heritage Festival’s Folklife Village and at other events across the state. With their children, grandchildren, and even great-grandchildren involved in the Eunice courir—an event largely unchanged since Allen’s father and Georgie’s grandmother took part—the family now boasts six generations of Cajun Mardi Gras revelers. Farris, Teresa Parker "Georgie and Allen Manuel." In https://64parishes.org Encyclopedia of Louisiana, edited by David Johnson. Louisiana Endowment for the Humanities, 2010–. Article published September 12, 2012. https://64parishes.org/entry/georgie-and-allen-manuel. Ancelet, Jean Barry, and James Edmunds. “Capitaine, Voyage Ton Flag”: The Traditional Cajun Country Mardi Gras. Lafayette: Center for Louisiana Studies, University of Southwestern Louisiana, 1989. Lindahl, Carl, and Carolyn Ware. Cajun Mardi Gras Masks. Jackson: University of Mississippi Press, 1997.